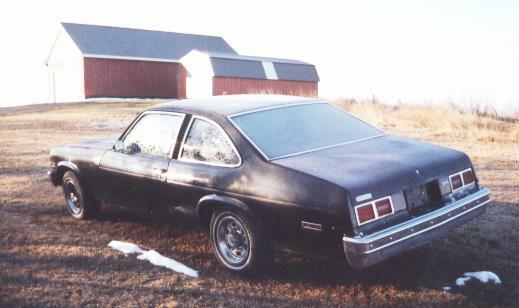 After finishing the restoration of my '74 Nova I decided to buy another Nova to use as a daily driver. Finding a suitable car here in Maine involved a bit of searching. I found a few completed restorations for sale but those were too nice to use as a daily driver (not to mention expensive too). I also found quite a few rust buckets that would have required way too much work to make them road worthy again. Finally, I found this '77 and brought it home in November 2000. Like my 74, the sub frame and other structural elements of the body are solid with only some minor surface rust. There are some rust holes along the bottoms of the doors that have been filled with bondo. I plan to cut those out and weld in new metal (lower door skin patches). There is also some rust in the bottoms of the quarter panels, trunk floor, and rear bumper inner reinforcement beam that will require welding in some new metal as well. 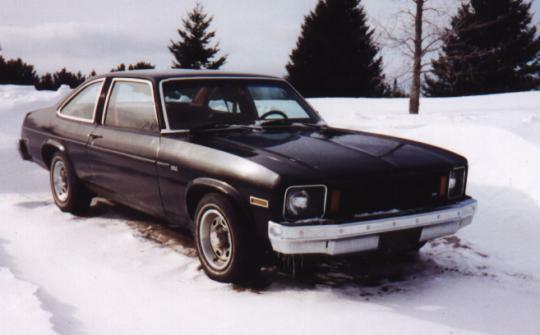 The original color of the car was Silver Metallic (GM #13) but it has been re-painted black. The black paint is chipping and peeling in several places, exposing the silver underneath. It doesn't look like very much prep work was done prior to the black paint. The driver side front fender is quite rusty and appears to have been brown under the black spray paint that doesn't match the rest of the car. I think it was replaced due to a minor accident. I plan to replace that fender with a better one. The interior is in decent condition. The instrument panel bezel is in nearly mint condition. Someone replaced the original radio with an aftermarket stereo from Radio Shack but fortunately they didn't do any cutting to make it fit. I'll be replacing the cracked dash pad and headliner with better ones from a parts car. The front seat appears to have been re-covered sometime in the past but some of the seams are coming apart. I'll eventually have the seats re-upholstered. The original carpet still looks decent for it's age although it is a little worn and faded in some areas. 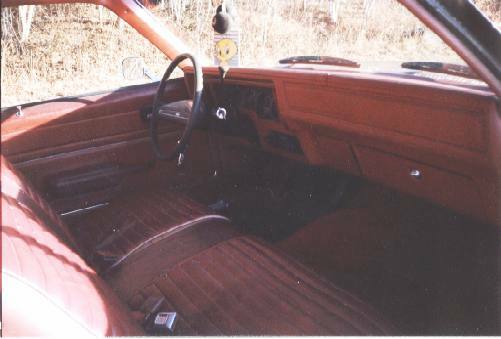 Some of the other interior panels (especially those around the rear windows) are a bit faded and sun damaged. I'll see if I can find some better replacements and/or restore their color with some interior paint. Under the hood is pretty much all original. The distributor cap and spark plug wires are about the only things that appear to have been replaced. 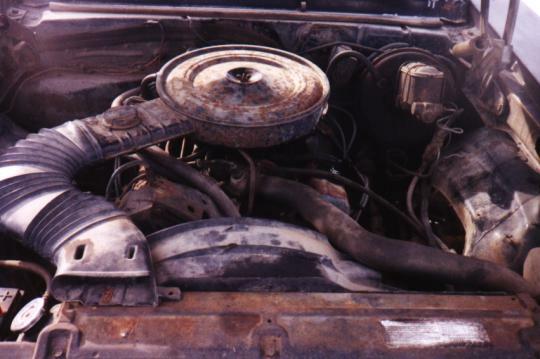 It still has the original belts and radiator hoses that are well overdue for replacement!! The transmission was originally a TH200 but it has been replaced with a TH350. Unfortunately, these cars were all over 100 miles away so hauling them all home wasn't cost effective. The 78 2-door was the best of the bunch so I did bring that one home. There wasn't much left of the 78 4-door so the seller allowed me to strip that one down and leave the rest behind. A guy here in town was looking for a roof and other parts to repair his 78 4-door Nova that had been involved in an accident with a moose. So I made a deal with him. I gave him the roof and parts off the 76 4-door in exchange for him hauling it home. As things would eventually turn out, he welded that roof onto his 78 and then gave up on the project. So four years later I ended up buying his car for parts as well. My plan for this car is to "fix it up" rather than giving it a complete restoration. I will be taking the time to clean/paint/detail most of the parts while they're off for repair work. However, I am not going to invest lots of money into an expensive paint job, NOS parts, re-chromed bumpers, and such. I put about 5000 miles on the car this summer with only one major problem. In June the intermediate roller sprag broke in the TH350 transmission (which the former owner had installed as a replacement for the car's original TH200). I swapped in a used TH350 that I had sitting in the garage and had the car back on the road within a few days.